The Ritz-Carlton Club sets the bar for luxury in Lake Tahoe. Adding the five star services of the Ritz-Carlton to the North Lake Tahoe area will provide an unforgettable experience that can only be found in a handful of ski-in/ski-out properties in the world. Their newest project is nestled in the Sierra Nevadas and is just a gondola ride away from the Northstar Village. Lake Tahoe's natural beauty combined with superb year-round outdoor recreation makes it one of the most desirable vacation spots in America. With the largest alpine lake in North America and the striking Sierra Nevadas visitors will never tire of this mountain retreat. The area boasts a variety of outdoor, multi-season activities: from hiking, mountain biking and fly fishing to skiing, snowshoeing and snowboarding. The stunning mountain-side residences include all the privileges of Ritz-Carlton living, plus the charming delights found nearby. The Northstar Village, a world-class alpine village features live music, special events, an outdoor ice skating rink, boutiques, art galleries and restaurants. Historic downtown Truckee also offers visitors outstanding dinning and recreational activities. "Nestled within the Sierra Nevada and only minutes from Truckee, Calif., Northstar Resort is in the midst of a multi-million dollar transformation, and the fractional ownership, Ritz-Carlton Club, Lake Tahoe is part of this exciting expansion," says Eric Moulton, vice president, asset management west region. "Additionally, we are proud to announce the new gondola connecting Highlands and the Village. This will further establish Northstar as a premier mountain experience." The ski-in/ski-out fractional ownership residences boast mountain and valley views of the Sierra Nevada. Combined with the dedicated Club amenities and the adjacent Ritz-Carlton resort services, these elements create an unparalleled lifestyle in Lake Tahoe. Upon completion in late 2009, the property will feature 78 two-, three- and four-bedroom residences ranging in size from 1,533 to 2,638 square feet. 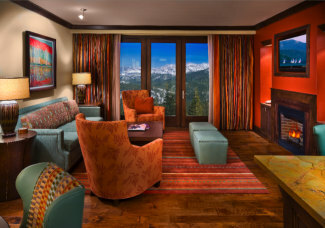 The interior design is inspired by native Indian influences stylishly blended with classic mountain design. Each residence features top-of-the-line appliances, Italian marble bathroom floors, gourmet kitchens and a minimum of two baths each. The club offers 1/12 interest providing 21 to 35 usage days per year. Prices range from the low $100,000s to the high $800,000s. Additionally, members pay annual dues to cover operating and maintenance costs. Ritz-Carlton Club Members have use of their residence on a rotating calendar, assuring access to prime season versus owning the same week every year or an open reservation system working on a "first come, first serve" basis. Each year, Members are allocated a specific number of days based on a property's usage calendar. A portion of this time may also be used at resorts throughout The Club portfolio on a reciprocal use basis. Throughout the year, Members have an opportunity to reserve supplemental time on a space available basis, if they so desire. Dedicated concierge services for travel needs, dinner reservations, tee times, etc. "We evaluate each location on a case by case basis," says Moulton. "However, The Ritz-Carlton is emerging as the world's premier lifestyle brand. It now includes everything from hotels, fractional and wholly-owned homes, spas and retail shops to restaurants, managed golf courses and a magazine. The synergy created at Bachelor Gulch, St. Thomas and shortly, Lake Tahoe, by blending these businesses of a hotel and fractional residences has proven to be extremely successful. The goal is to offer premier locations worldwide with balanced focus on golf, ski, beach and urban experiences." The club has several projects underway. If a beach or city vacation is on your agenda, your reciprocal privileges allow you access to one of The Ritz-Carlton Clubs in highly coveted destinations including St. Thomas, San Francisco, Hawaii and South Beach. The club has also announced The Abaco Club on Winding Bay, A Ritz-Carlton Managed Club in The Bahamas and future locations in Kapalua Bay in Maui and Kauai Lagoons, Hawaii; North and Vail, Colo.